Everything you thought you knew about shark movies should just be thrown out the damn window. 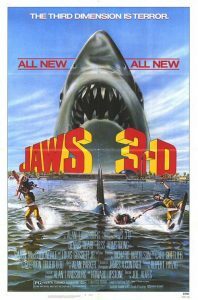 Billed as a 3-D movie (the awful blue and red kind), Jaws 3 goes to great lengths to point stuff at the screen. The main character Mike Brody is played by Dennis Quaid. He and his younger bro character, Sean, are the only link back to the other Jaws movies. Mike works as some sort of oceanic engineer or something at Sea World Orlando, where a couple of great white sharks decide to sneak in when a gate is open and unleash bloody chaos on the entire park. Things get good about 1 hour in when the larger great white mother shark starts killing everything as retribution for her dead baby shark. Other notable cast members include Louis Gossett Jr. as the main park administrator and Lea Thompson as the love interest for younger bro Sean. Almost all the FX shots are total garbage. You can tell immediately when it is a composite shot due to the surreal layering of the elements thrown together. Some of the shark shots seem to be reused. There is one odd scene where a scuba diver suddenly ends up completely inside the shark’s mouth/throat as it keeps chomping away until the shark teeth finally grind the meat. The biggest problem is too much showing the shark and the editing is so ridiculous, it feels like most of the action/suspense is going in slow motion. This becomes glaringly apparent in the climactic control room attack scene near the end. Laughable, man.